This shop has been compensated by Collective Bias, Inc. and its advertiser. All opinions are mine alone. 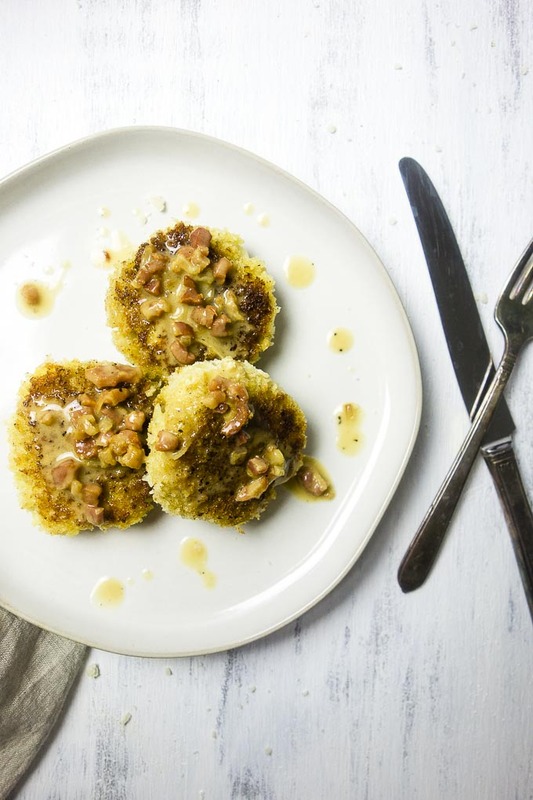 #NewYearNutrition #CollectiveBias A simple made risotto is perfect eaten on its own, but even more fun used in these pan fried risotto cakes with a creamy pancetta and shallot sauce. 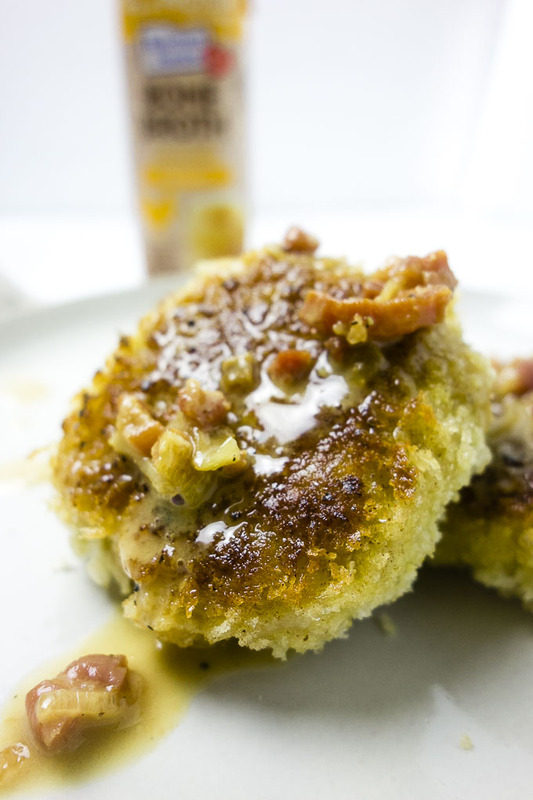 Easy to make, and a perfect way to use leftover risotto, these risotto cakes are perfection! Risotto is one of those ultra delicious and comforting dishes, that while not hard does take a little bit of time to cook correctly. However, it is TOTALLY WORTH IT. 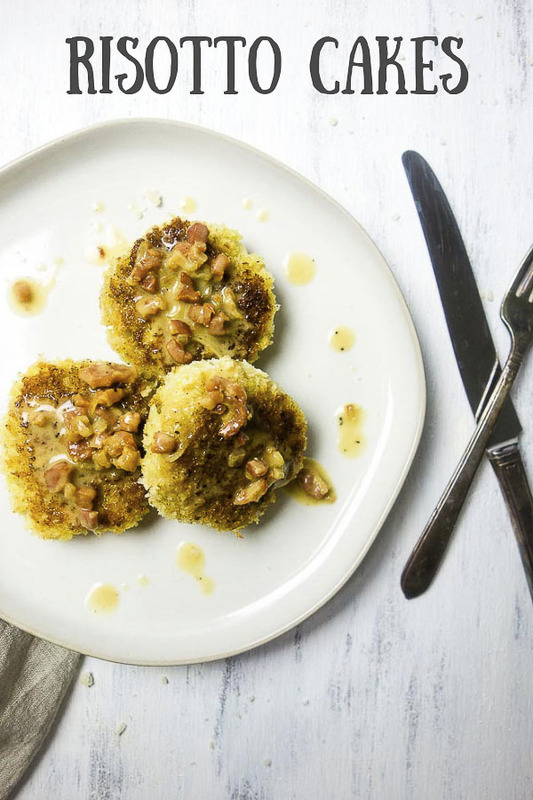 These risotto cakes are made with leftover risotto, but I know leftover risotto is not always in your fridge (we can dream right?). So we’ll make a batch of risotto and store it in the fridge overnight to get the consistency we’re looking for. 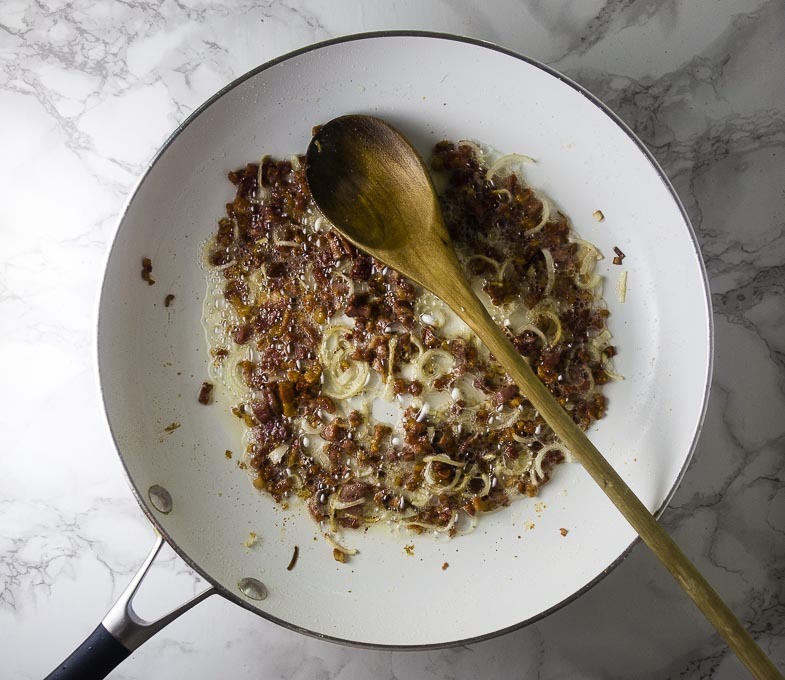 And that creamy pancetta and shallot sauce….guys if you weren’t already in heaven with just the risotto cakes, this will just take you over the edge into that blissful feeling of “nothing else matters but this food.” I love that feeling. 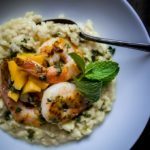 If you are a big fan of risotto, check out this amazing Coconut Milk Shrimp Risotto. Like I said, you need leftover risotto as well as pancetta and shallots to make this recipe. What is risotto made of? Risotto is typically made with arborio rice, chicken stock (or in this case bone broth), and white wine, as well as seasoning and aromatics. 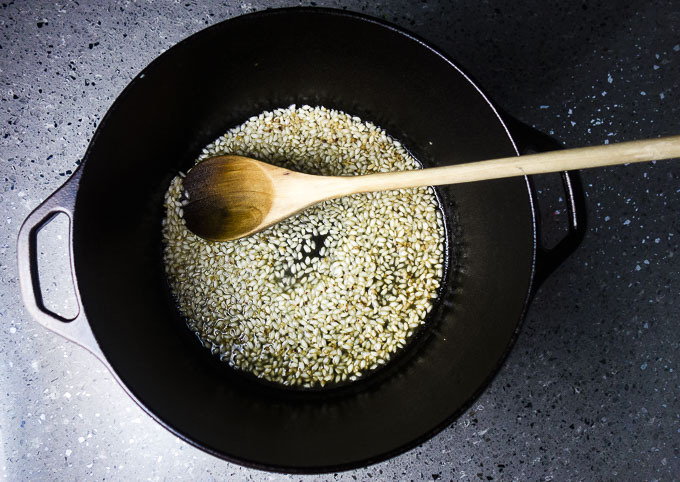 Arborio rice is a short grained rice that is starchier than other types of rice. Because it has so much starch, the consistency comes out chewy and creamy when cooked in dishes like risotto. I use Kitchen Basics Chicken Bone Broth to make these risotto cakes. 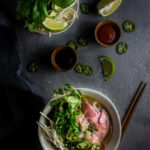 Bone broth has a much richer flavor and consistency than regular chicken broth, and adds s much deliciousness to this dish. 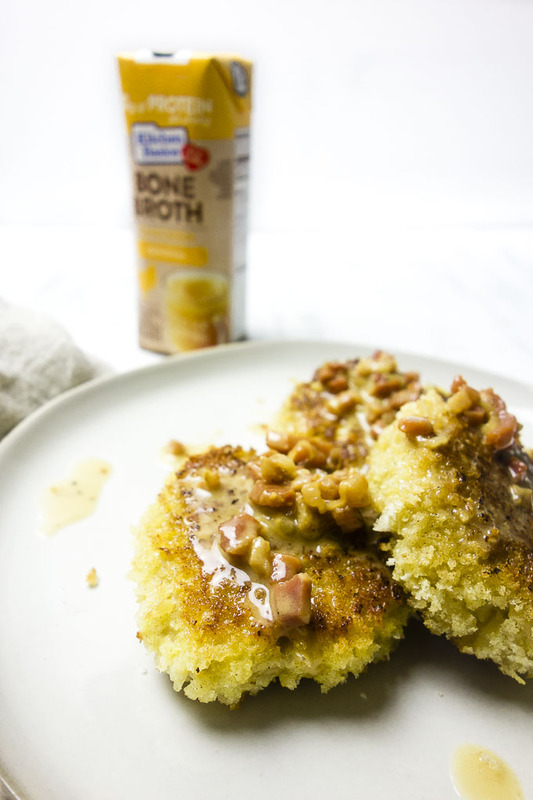 I partnered with Kitchen Basics, one of McCormick’s brands, to bring you this risotto cake recipe using the Original Chicken Bone Broth. 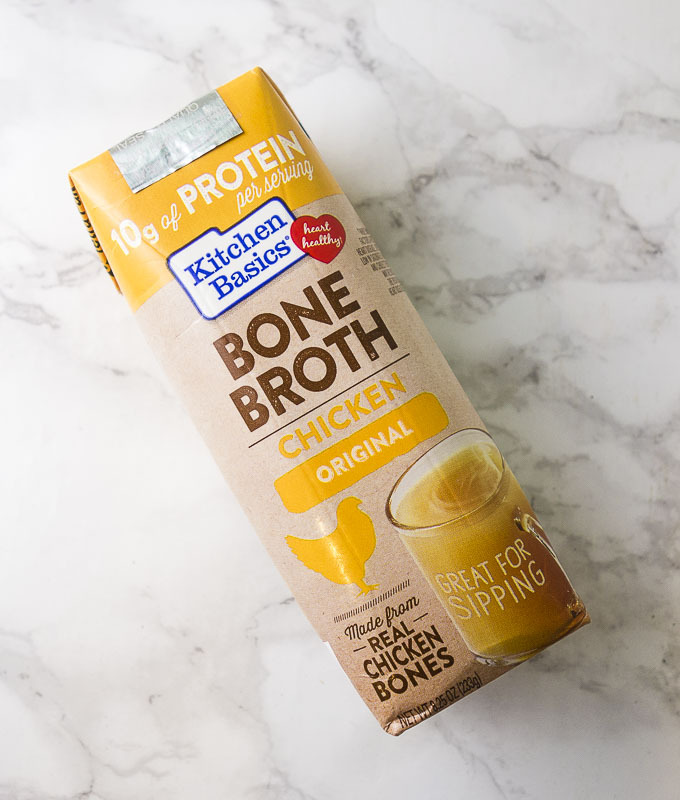 Kitchen Basics Bone Broth is a rich, savory bone broth full of protein and flavor. In the industry for 20+ years, Kitchen Basics introduced the first ready-to-use stocks in 1996. They strive to help cooks make food taste great. 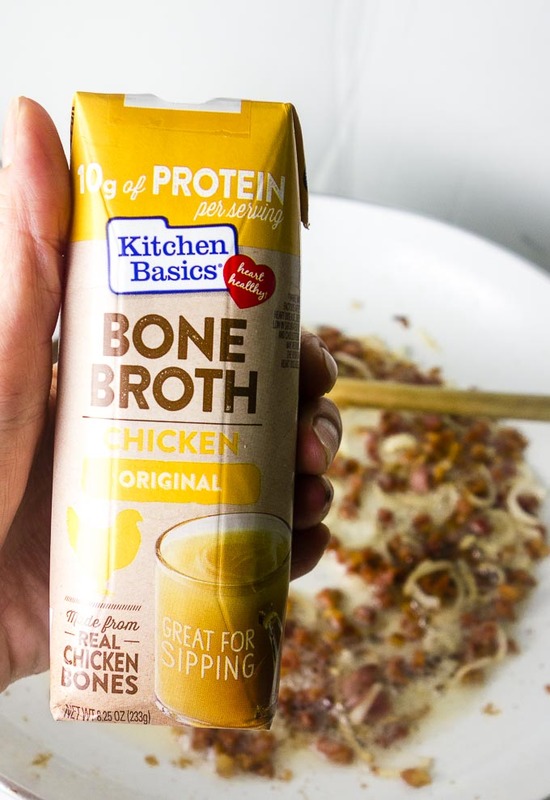 Kitchen Basics Original Chicken Bone Broth can be purchased HERE on Amazon. 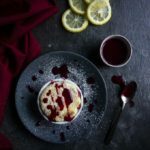 If you don’t have leftover risotto, scroll down to see the instructions for making risotto first. Remember, you will want day old risotto to make these risotto cakes. 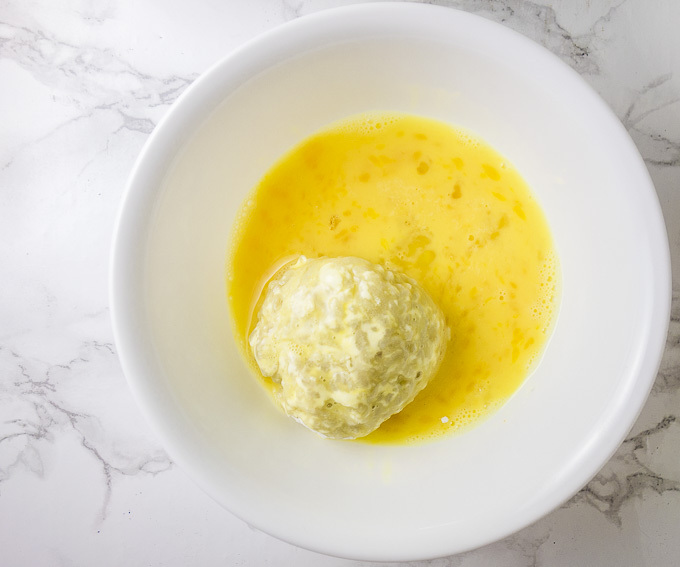 Form the leftover risotto into 3 inch balls and flatten slightly to make round disks. 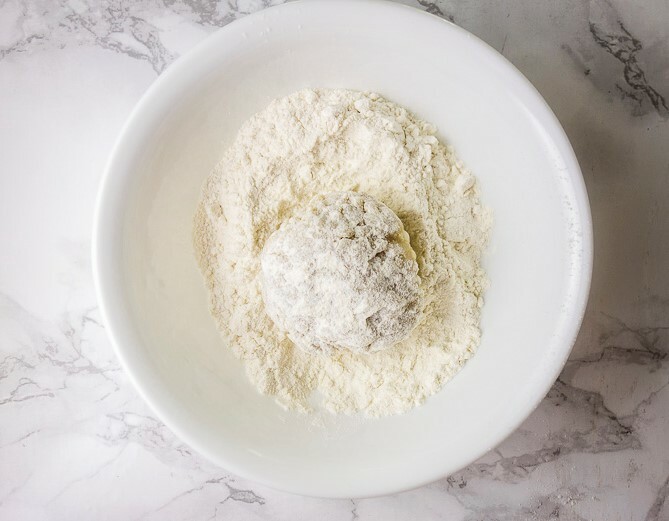 Place the breadcrumbs, eggs and flour in separate bowls. And roll it in the panko breadcrumbs. Heat 2 tbsp. of butter in a nonstick skillet over medium heat. 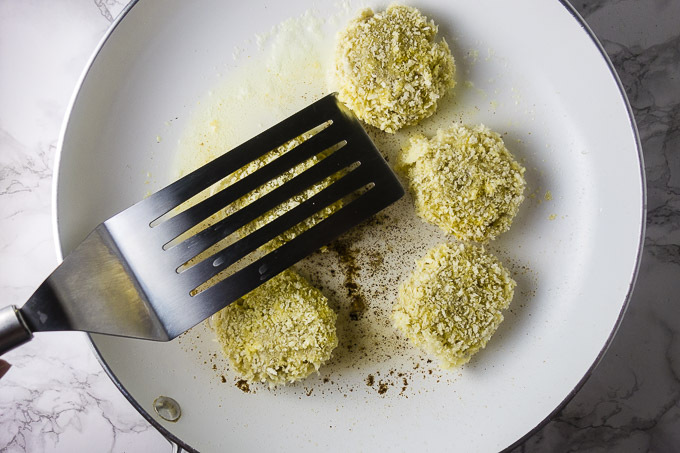 Add the risotto cakes to the skillet and fry for 3-5 minutes per side, or until golden brown. Use the back of a spatula to just slightly flatten them. 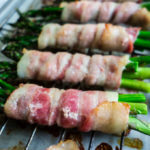 Remove and serve drizzled with the creamy pancetta and shallot gravy. **for all steps below, you want to stir the rice often. Heat the olive oil in a dutch oven over medium heat. Add the rice and cook, stirring constantly, for about 2-3 minutes. Kernels should start to get opaque around the edges. Add the white wine and cook, stirring, until most of the liquid has absorbed. Then add the chicken broth, 1/2 cup at a time, cooking until the liquid has absorbed before adding the next half cup. Continue until all broth has been added and most has been absorbed (about 15-20 minutes). Risotto will have a little excess liquid when done. Store in the fridge overnight to let the risotto firm up so we can make the cakes. Heat a skillet over medium heat and add the pancetta. Cook until fat starts to render and pancetta browns, about 5-7 minutes. Add the shallots and cook until they start to caramelize, about 3-5 minutes. Be careful not to burn them. Cook for about 3-5 minutes then add the cream. Bring back to a simmer and cook 2-3 minutes, or until sauce has thickened slightly. It should have a gravy-like consistency. Stir the risotto continuously while making it. If you leave it for a few seconds here and there, it will be fine, just don’t dump the broth in and leave it. 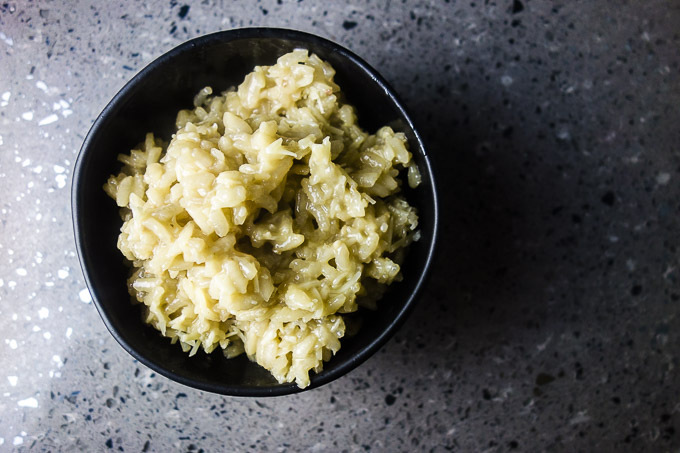 The risotto should be made in advance and stored in the fridge until ready to use. If you try to use fresh made risotto, the cakes will not bind together well. If the skillet starts to smoke at all while cooking your risotto cakes, add another tbsp. of butter and turn the heat down just SLIGHTLY. Be careful not to turn it down too much or the risotto cakes won’t brown. 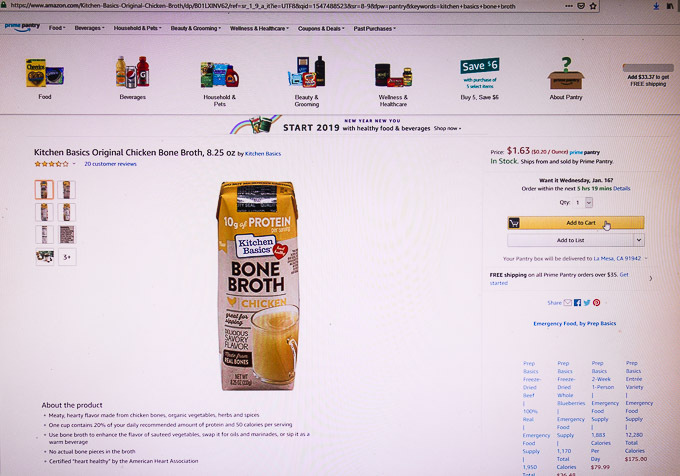 Purchase Kitchen Basics Original Bone Broth on Amazon HERE. Can you make risotto cakes in advance? Cooked risotto cakes can be stored in a covered container in the fridge for up to 3 days. To reheat, place in a 350 degree oven for 5-10 minutes, until warmed through. You can also reheat in a microwave, but the risotto cakes will not be as crisp. Can you freeze risotto cakes? The risotto cakes can be frozen before or after cooking. To freeze before, coat them in the breadcrumbs per the recipe instructions, then place them on a baking sheet directly in the freezer for 3 hours, or until frozen through. Store in a freezer bag for up to one month. Thaw in the fridge overnight then cook in the skillet in accordance with the recipe instructions. To freeze after cooking, place cooked risotto cakes on a baking sheet directly in the freezer for 3 hours, or until frozen through. Store in a freezer bag for up to one month. To thaw, place in the fridge overnight. To reheat, place in a 350 degree oven for 5-10 minutes, until warmed through. You can also reheat in a microwave, but the risotto cakes will not be as crisp. Did you make these risotto cakes? Follow me on Instagram, post a photo and tag @wenthere8this or #wenthere8this. I love to see what you’re making! Leftover risotto formed into cakes and pan fried in butter, then drizzled in a creamy pancetta and shallot gravy. 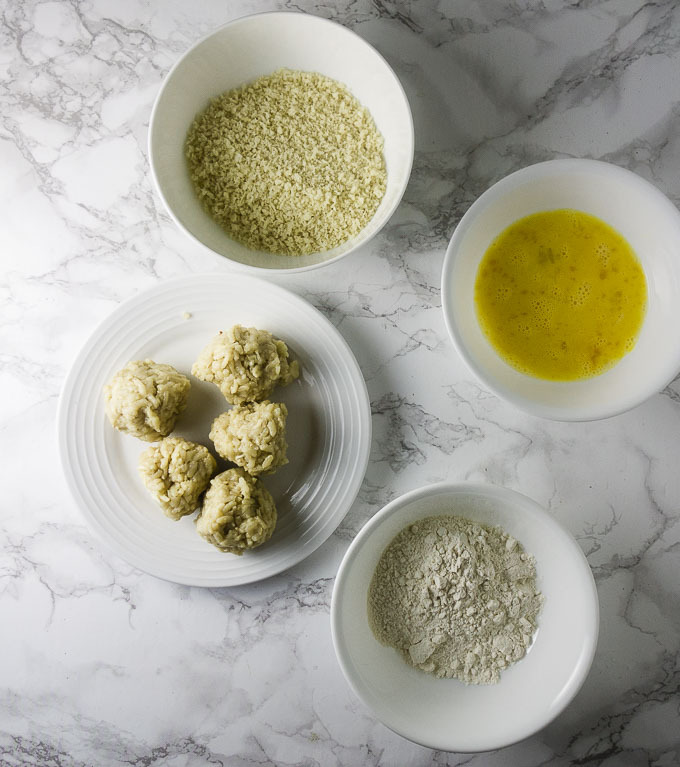 Form the leftover risotto into 3 inch balls and flatten slightly to make round disks. 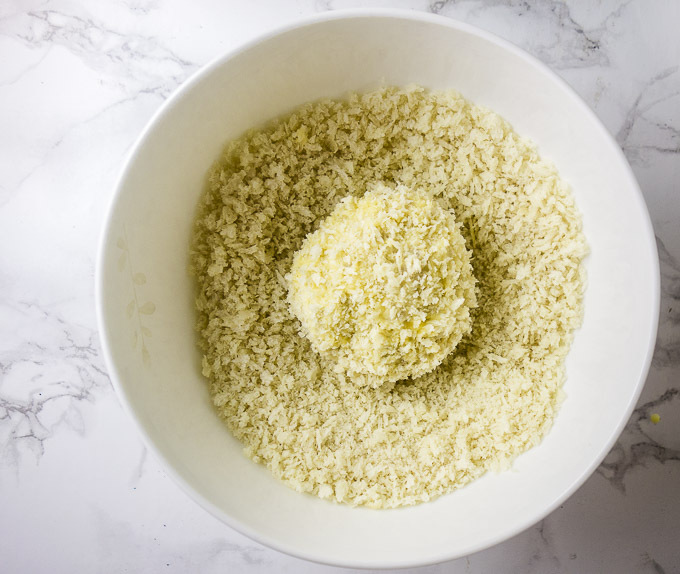 Dredge the risotto cakes in flour, dip in egg, then roll in the breadcrumbs. Heat 2 tbsp. of butter in a skillet over medium heat. 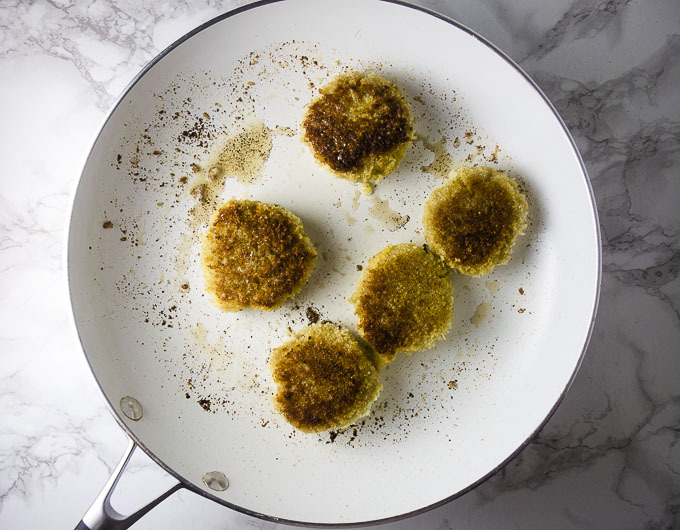 Add the risotto cakes to the skillet and fry for 3-5 minutes per side, or until golden brown. 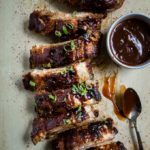 Remove and serve drizzle with the gravy/sauce. **for all steps below, you want to stir the rice often. Heat the olive oil in a dutch oven over medium heat. Add the rice and cook, stirring constantly, for about 2-3 minutes. Kernels should start to get opaque around the edges. Add the white wine and cook, stirring, until most of the liquid has absorbed. Then add the chicken broth , a 1/2 cup at a time, cooking until the liquid has absorbed before adding the next half cup. Continue until all broth has been added and most has been absorbed (about 15-20 minutes). Risotto will have a little excess liquid when done. Store in the fridge overnight to let the risotto firm up so we can make the cakes. 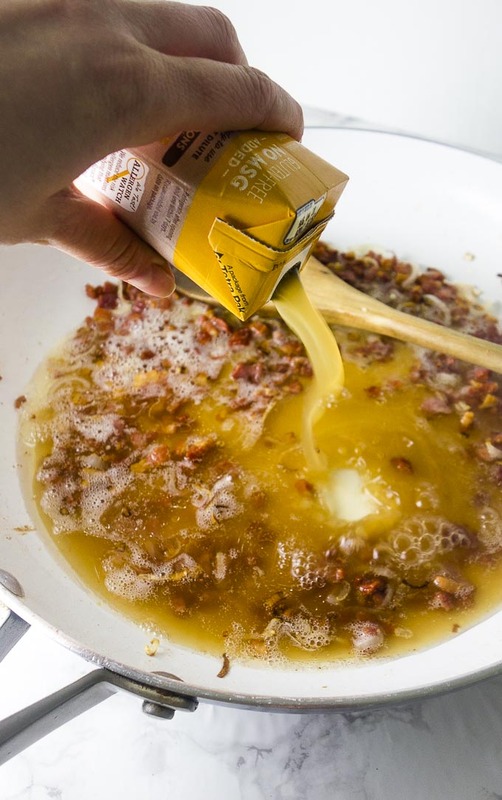 Heat a skillet over medium heat and add the bacon fat and pancetta. Cook until fat starts to render and pancetta browns, about 5-7 minutes. Add the shallots and cook until they start to caramelize, about 3-5 minutes. Be careful not to burn them. Add the chicken broth and bring to a simmer. Cook for about 3-5 minutes then add the cream. Bring back to a simmer and cook about 5 minutes, or until sauce has thickened slightly. It should have a gravy-like consistency. Stir the risotto continuously while making it. If you leave it for a few seconds here and there, it will be fine, just don't dump the broth in and leave it. If the skillet starts to smoke at all while cooking your risotto cakes, add another tbsp. of butter and turn the heat down just SLIGHTLY. Be careful not to turn it down too much or the risotto cakes won't brown. I bet these are so crispy, but nice and creamy on the inside! 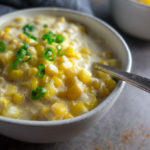 I love risotto and know what I am making the next time we have leftovers! I haven’t Cooked with bone broth. Looks it is nutritious. This left over risotto cakes looks delicious. perfect treat. 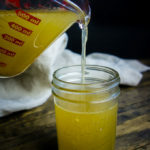 Bone broth is so delicious to cook with! Thanks Swathi! You can’t beat delicious risotto as a side (or a complete meal). And we’ve stopped purchasing regular broth and started buying stock or any broth MADE with bones. So much better and tastier too. This recipe would be ideal with our chicken tonight — so yummy with the panko crumbs. 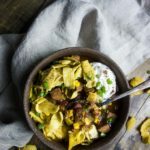 The bone broth is so much better than regular old broth! 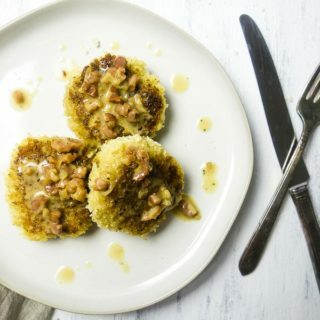 I’ve never made risotto cakes but I’ve been seeing some varity of it all over for the last few months – and I really need to try it next time I make risotto!! 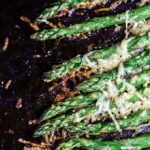 This recipe looks so delicious & I love the addition of panko breadcrumbs – that just makes everything so much tastier!! It’s such a great way to use leftover risotto! Hope you try it out Emmeline! These risotto cakes look fantastic I just love the flavors and they are even perfect for a snack!